Classic MC Bassman. He takes over another MCs set to ride one track. 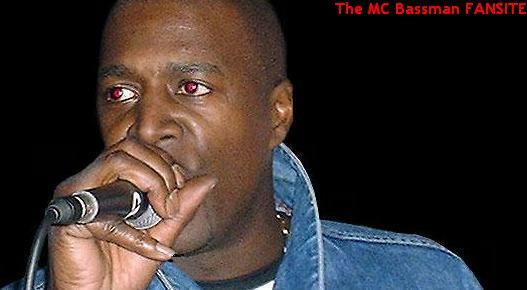 The only website dedicated to the Drum and Bass heavyweight MC Bassman. MC Bassman has been running the Drum and Bass scene in the UK and abroad for many years now, but this is the only website dedicated to him. We currently have pages dedicated to: Photos, Lyrics, Audio, CD & Tape Packs, Merchandise, & Events. If you have any ideas about what you would like to see here then contact us! Very rare official MC Bassman clothing was released a few years ago but is no longer available. The garments had Bassman quotes printed on the front and back, quotes like "Very Heavy Heavy Heavy" and "For Those Trying To Get Close To Us...Not Too Close." MC Bassman fans could be scene at Drum and Bass raves wearing the T Shirts. Available were mens T Shirts and ladies Vests in various colours. Check out some photos in the MC Bassman Merchandise section. 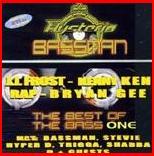 MC Bassman MC's all over the UK every week at Drum and Bass events and has been doing so for many many years but there are only a handfull of CD & Tapepack releases from Bassman. Most of these packs are now discontinued but can still be bought second hand on eBay and some online Drum and Bass record shops. Read more about these in our CDs & Tapepacks section. 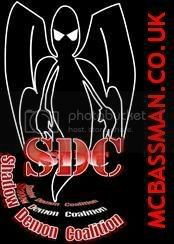 The Shadow Demon Coalition consists of MC Bassman, MC Trigga, MC Shaydee and DJ Sly. This trio will pack any club to capacity, people will travel all over the UK to hear the SDC. DJ Sly's darkside Drum and Bass is perfect for the styles of Bassman, Trigga and Shaydee. You can read more about the Shadow Demon Coalition in our Profiles section. Don't forget to check out the Audio section for some dark SDC mixes. 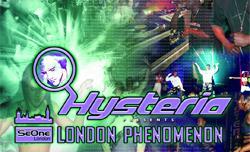 Hysteria is probably the most famous Drum and Bass club night in the UK. Its been going strong for over a decade now and MC Bassman has always been a headlining MC at virtually all Hyteria raves. The latest Hysteria Tape Pack is Hysteria 45 - Extreme Bass Generation and Hysteria 46 took place on March 18th 2006 so the next tape pack is due for release very soon. Look out for the early Hysteria tapes with MC Bassman and MC Spyda. You can read more about Hysteria in the Bassman Events section.